Tag line: "You're all going to die"
While I wasn’t all that impressed with 2002’s Resident Evil, I still wanted to check out its sequel, Resident Evil: Apocalypse, mostly because I thought the first film’s tale of infected zombies had a lot of potential (which, alas, wasn’t fully realized). And while it’s not the home run I was hoping for, Resident Evil: Apocalypse is nonetheless a definite improvement on its predecessor. When the Umbrella Corporation reopens “The Hive”, they release the deadly T-Virus into the air, turning thousands of people in Raccoon City into bloodthirsty zombies. The entire town is quickly quarantined, leaving many innocent (and not yet infected) citizens trapped inside. Alice (Milla Jovovich), a former Umbrella employee who faced off against the Hive zombies a while back, teams up with police officer Jill Valentine (Sienna Guillory), commando Carlos Olivera (Oded Fehr) and a handful of others to try and make it out of the city, something that becomes increasingly more difficult as the infection spreads. When scientist Dr. Charles Ashford (Jared Harris) offers to show them a way out in exchange for rescuing his daughter (Sophie Vavasseur), Alice and her rag-tag crew fight like hell to make it happen, only to come face-to-face with Nemesis, the Umbrella Corporation’s newest genetic “creation”, which has no intention of allowing them to escape. Like Resident Evil, Apocalypse features some pretty nifty scenes. When we’re first introduced to Jill Valentine, she's strolling into her precinct and calmly taking out a few zombies, finishing them off with a bullet to the head while telling everyone else to get out of town. Our heroes even go up against zombified dogs, which prove rather difficult to kill. Apocalypse also uses its setting to great effect, with Raccoon City giving the infected more places to hide than the underground laboratory in Resident Evil did, resulting in a number of nerve-shattering “surprises”. 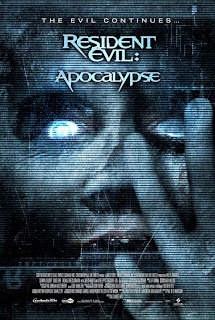 On the downside, Apocalypse occasionally suffers from a music video mentality (which its predecessor also had), with key action scenes ruined by quick edits and shaky cams (even the early TV news reports are cut together this way, and I’m pretty sure confusing its viewers isn’t one of the media’s primary goals). Character development is also weak in this film, much like it was in the original. Granted, this isn’t normally a concern in action-packed movies like this one, but then don’t expect us to get all teary-eyed when a key character is infected or killed, seeing as we’re not totally invested in them in the first place. Fortunately, these weaknesses, which acted like an anchor on the original film, are only a minor inconvenience this time around. 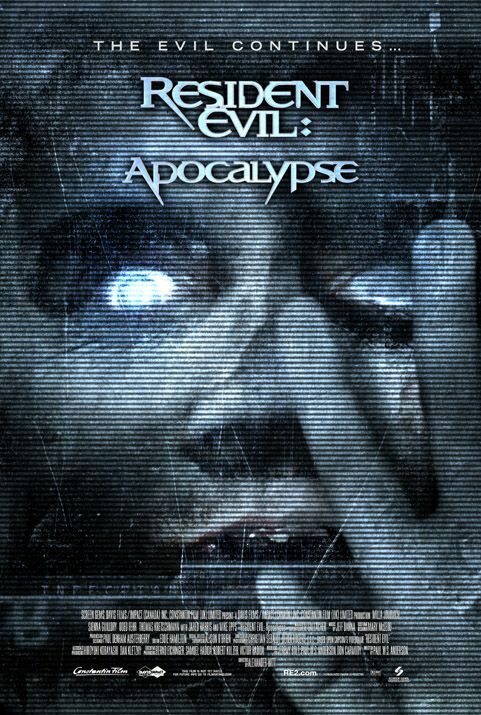 A better movie than the 1st Resident Evil, Resident Evil: Apocalypse, at the very least, had me excited to see what the filmmakers were going to come up with next. I'm a big fan of the Resident Evil movies, but I do have mixed feelings about this one. I like it better in some ways than #1 (I'm really more of an action-adventure fan than a horror fan), but I thought the direction could have been better in spots. Your point about the fast cuts in the fight scenes is spot-on; in the cast commentary they come close to saying that the final fight between Alice and Nemesis was far more exciting to watch on the set than what made it into the film. If you want more character development, you'll really like the next one (Extinction). It's probably the most character-oriented of the series, and the fight scenes are excellent, too. On DVD, I think it's the best of the series. I qualify it that way because the last two have been in 3D and Anderson's use of 3D is excellent (I've even seen some critics acknowledge this :-) ).